The July storm drove some large moths to seek shelter indoors. Charlotte from Lower Tale reported a Magpie moth, beautifully patterned black, white and yellow, and we had a glorious Red Underwing, one of the largest moths you can see. I understand that some people do not like moths, believing them to be guilty of making holes in clothes. 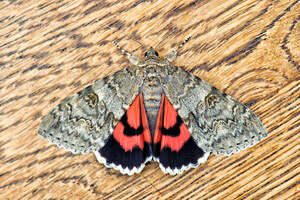 Actually there are only four species that do this, all very small moths indeed. We lost all our plums. The wasps took the greengages. As for the Victoria plums, one night they were there, the next morning only 4 were left. 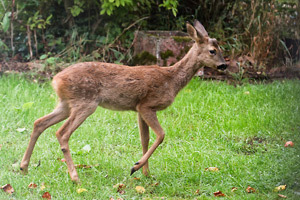 We suspected squirrels until a Roe deer and fawn turned up the next day in broad daylight. I can only hope they gave them tummy ache! They have now turned their attention to decimating our rose garden. Something has to be done. 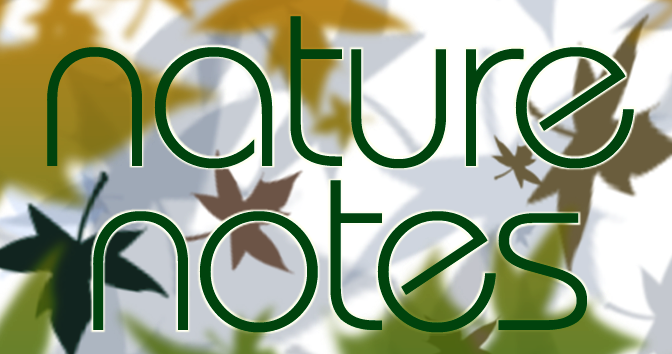 I am disinclined to use an electronic repellent device, as this would adversely impact on all the other wildlife and so I may have to resort to spraying noxious smelling/tasting compounds; any suggestions? 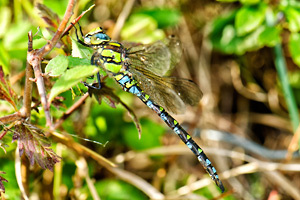 Considering we have the stream running right through the garden, we do not see many dragonflies and so it was with pleasure we watched as a Southern Hawker scoped out our 4-year old granddaughter. This is an inquisitive species and will happily approach you very closely. I enjoy inspecting the moth traps before I go to bed – this can be such a peaceful time of the day and in calm, warm conditions it is an occasion to savour. I particularly enjoy playing hide and seek with the juvenile Little Owls, which seem to treat our patch as a creche, up to three or four at a time, and if I am very lucky they become inquisitive and I get to see them in clear view with the help of my head-torch. They are readily located by their calls (for food) and if I answer back a head may suddenly appear round a branch and characteristically bob up and down. Eventually, the parents will stop feeding them and they will all disperse. 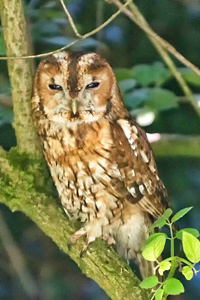 There have also been some impressive stand-offs with the juvenile Tawny Owls. I am always on the lookout for photo opportunities, and so should anything interesting turn up, or you know where there are daytime roosts for owls or raptors, perhaps you will let me know.